Off Grid homes, solar water heating systems, wind power. In 2008 Ian Goudie contacted me about a power system for his Yoga retreat on the Avalon Peninsula Newfoundland. After a couple years of communicating, and the installation of a 2500 foot penstock, he was ready for me to install the system. 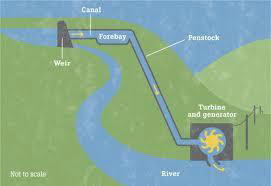 First of all, a microhydro power system works the same way many other hydro power-systems work, only on a smaller scale. 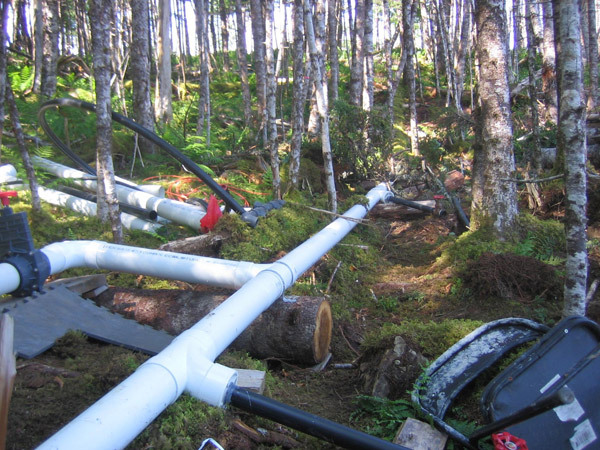 The penstock he built for this system is made of 4" pvc pipe which winds its way like a great sighing serpent through the woods, up the hill, across two bogs to finally end in the weir he built. The turbine was to be housed in the small chordwood building that he built. The first task was to put the turbine in place and connect it to the batteries and dump load. 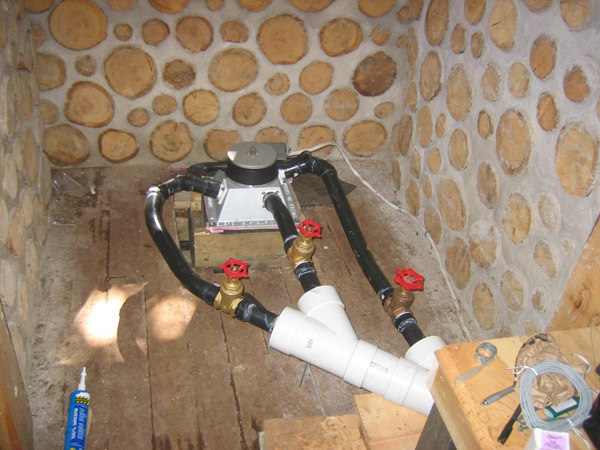 A microhydro system must not be run without an electrical load on it. I installed the batteries, a Tristar controller from Morningstar, and four 1ohm resistors, connected in parallel sets of two in series. The Magnasine inverter was also connected to the batteries at this stage. The next task was to mount the turbine in place with lag bolts and plumb it to the 4? pvc. With a bit of ingenuity, we used a propane torch to bend the ABS pipes in exactly the right angle to attach to the three nozzles on the turbine. After all was glued in place, like two giddy teenagers, now near 10:00, the sun having been long down, we couldn't help but lift the knife valve and spin it up. As the turbine began to spin with a satisfying whirr, I checked the voltage on the batteries, sure enough it had gone from 24.8 to 25.6 and it was still climbing. The batteries were charging as expected. Soon comfortable with the new sounds coming from the power shed we decided to open it up a little more, I opened the valves on the other two nozzles and the pressure dropped from 40 PSI to 20. Turbine speed actually slowed a little despite the greater volume of water passing through. We needed to open the knife valve and increase the pressure a little. As Ian slowly pulled the handle of the knife valve open, the turbine wound up like a jet engine, the tristar was blinking, indicating that, the batteries now satisfied, power was now being diverted to the resistors. A steady roaring of water now exiting the turbine was now audible, like the thunder of a 747 as it leaves the end of the runway and noses up into the sky. Then a wall of water hit my legs broadside and washed across the powershed floor like a tsunami. Ian, with great presence of mind (and some experience too) didn't drop the knife valve on the penstock in a single sweep but slowly eased off the flow till it stopped and only the drip drip from my pant legs reported on the nights skulduggery. Upon some examination with a flash-light, it wasn't the case that some glue had let go, or a pipe split, from of the opened joint it was quite clear that there was no glue ever applied to it. Ah well, that was enough fun for one night, with soaking boots I trudged off to bed. The next day we glued the joints, made some other last minute adjustments and spun the turbine up again, this time with pleasing results. It soon became clear that the power output exceeded my expectations of 700 watts and it could easily reach a full kilowatt. I added two third resistors in parallel with the other sets of two, to bring the resistance down from 1 ohm to ¾ of an ohm, and the power dissipation capacity from 1000 watts to 1500. Now with lots of diversion capacity to spare we wound the turbine up to 850 watts and there it stayed quite consistently afterward. 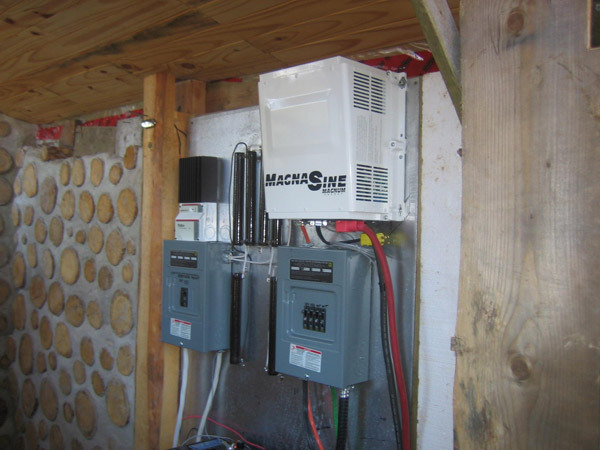 The Magna Sine inverter provide 4000 watts of continuous 240VAC Split Phase power and has kept up with the pneumatic nail guns, skill saws, table saws, compressors, cement mixers, lights and refrigeration that has been going on at the retreat since we started the system in late August 2010. 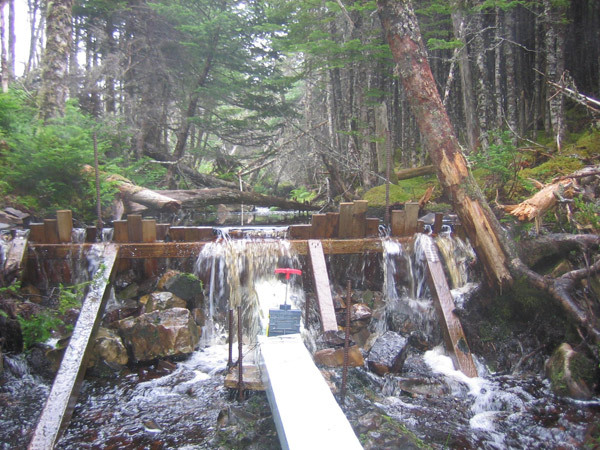 We built a T14 to replace WH500 near Sambro NS.